Most stories involving chocolate are already sweet enough; but when Bavarian couple Daniela and Johannes won our competition for a weekend trip to Berlin, the story unexpectedly took a beautifully romantic turn. The competition was the result of a collaboration between Wimdu and the Winterfeldt Chocolate Shop, down in lovely Schöneberg; one of the most beautiful areas of Berlin. The lucky winners would set off on a weekend trip to the German capital, with all travel expenses covered and a whole night alone in the chocolate shop, with the opportunity to gorge on as many of the extravagant selection of chocolates as they could. 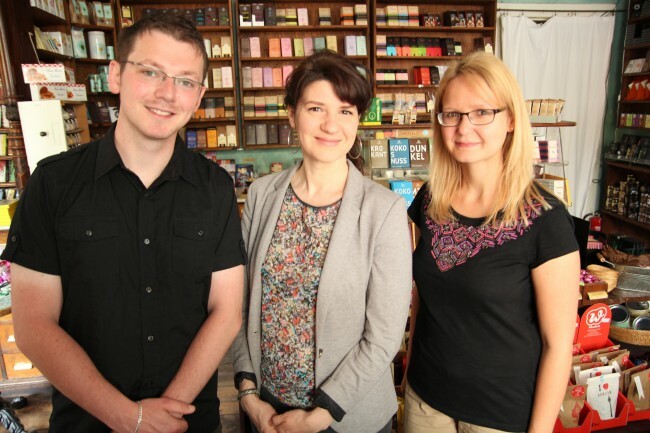 Daniela and Johannes pose with the chocolate shop’s owner. Johannes decided to grab this unique opportunity with both hands, and use it to ask his long time girlfriend Daniela to marry him. Both Daniela and Johannes are lovers of chocolate and travelling; so convincing her to take a few days off from her job at a digital & print media agency was easy. “We heard about the competition and it sounded like such an interesting and unique experience, I knew it was the chance I had been waiting for.” “We were absolutely thrilled to find out we had won, I couldn’t believe it” said Johannes, recounting the story afterwards. 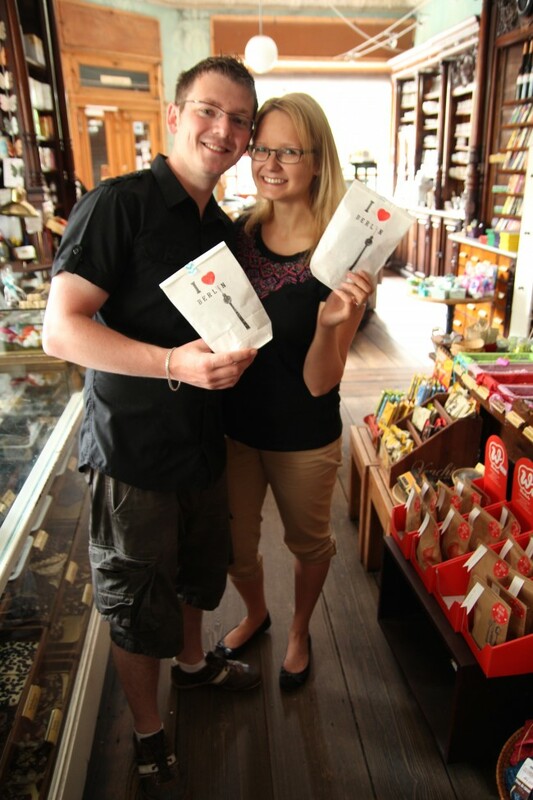 The happy couple, surrounded by chocolate. On the evening of the 6th June, as the rest of Berlin was going wild in celebration of the European Champions League final being played down the road at Olympiastadion, the couple were settling in for their night together at the shop, and Johannes was mastering his nerves before the big question. Johannes prefers to keep the exact details of the moment he popped the question a secret: “It was our moment” he says. Daniela, on the other hand, is keen to share the story, her face lighting up as she does so: “I came back into the room and he had made a heart shape out of candles, he took my hand and then got down on one knee”. The couple managed not to overindulge on chocolate for the rest of the night: “Honestly, we didn’t eat that much. Johannes prefers dark chocolate, while nougat is my favourite and we both love any chocolate with nuts in it.” After their magical night, both say that the taste of chocolate will remind them of the day that Johannes popped the question. Both are beaming when we catch up with them the next day for a little sightseeing: “I’ve been waiting a very long time for the perfect moment. I had a unique opportunity to seize upon, and it worked perfectly” says Johannes, who admits he has no idea what he would have done had she said no. For Daniela, the proposal was a very welcome surprise; “We have been together almost 5 years, and I have secretly wished; but I had no idea what Johannes had planned for this weekend in the chocolate shop, or that I would be coming home engaged”. Daniela shows off her new engagement ring. After a great day in Berlin, taking in the view from the top of the TV tower, Madame Tussauds Wax Museum, the East Side Gallery and plenty more, it’s time for Daniela and Johannes to enjoy one last evening in the city together. Their accommodation this evening will be a little less unusual, a lovely apartment supplied by Wimdu, in the same area of Schöneberg. “It was a little difficult getting up to the 5th floor, but worth it”. “Our room was beautiful, there was a lovely rooftop terrace and the hosts were very friendly”. Plenty more trips are on the horizon for Daniela and Johannes, who say they love to travel: “This is our fourth stay in Berlin, Daniela is going to visit Barcelona in July and last winter we visited Swedish Lapland and we would love to go again”. On top of all this, now they have a wedding to plan! It’s only a few days since the engagement, but the wedding is tentatively being planned for summer 2016. “The engagement is just for us, but the wedding will be a time to celebrate with all of our friends and family” says Johannes. Daniela, meanwhile, dreams of a romantic fairy-tale wedding in the sun, “In any case, there is sure to be plenty of chocolate”.